Thomas Woodrow Wilson (December 28, 1856 – Februar 3, 1924) wis the 28nt Preses o the Unitit States, frae 4 Mairch 1913 tae 4 Mairch 1921. A member o the Democratic Pairty, Wilson served as the preses o Princeton Varsity an as the 34t govrenor o New Jersey afore winnin the 1912 presidential election. As preses, he owersaw the passage o progressive legislative policies unparalleled till the New Deal in 1933. He an aw led the Unitit States in Warld War I, establishin an activist furrin policy kent as "Wilsonianism." 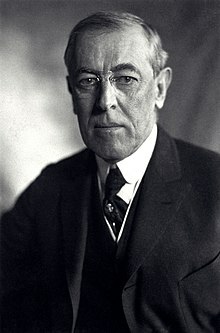 Wikimedia Commons haes media relatit tae Woodrow Wilson. This American politeecian–relatit airticle is a stub. Ye can help Wikipaedia bi expandin it. This page wis last eeditit on 17 Apryle 2019, at 00:17.